The Francis Crick Institute is currently accepting applications for its 2019 doctoral fellowships for clinicians. These fellowships provide an opportunity for talented clinicians passionate about research, with a strong academic track record, to perform biomedical discovery research while following a three-year clinical PhD programme. The Institute's multidisciplinary research aims to understand why disease develops and to help improve disease diagnosis, prevention and treatment. 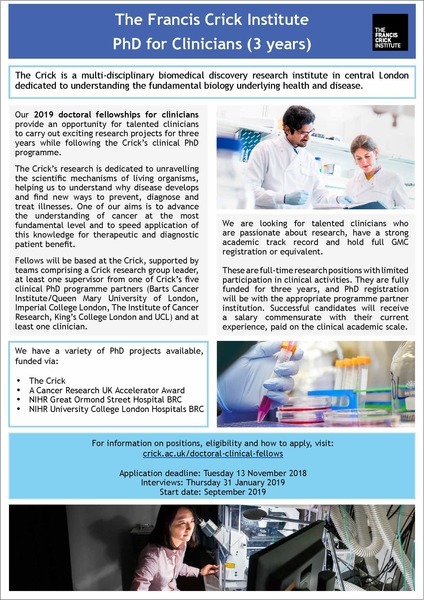 Fellows will be based at the Crick, with a Crick primary supervisor and a secondary supervisor from one of its five clinical PhD programme partners: Barts Cancer Institute/Queen Mary University of London, Imperial College London, The Institute of Cancer Research, King's College London and UCL. A variety of PhD projects are available, with funding from the Crick, Cancer Research UK, NIHR Great Ormond Street Hospital BRC and NIHR University College London Hospitals BRC. For more information on positions, eligibility and how to apply, visit: crick.ac.uk/doctoral-clinical-fellows or click the poster below.